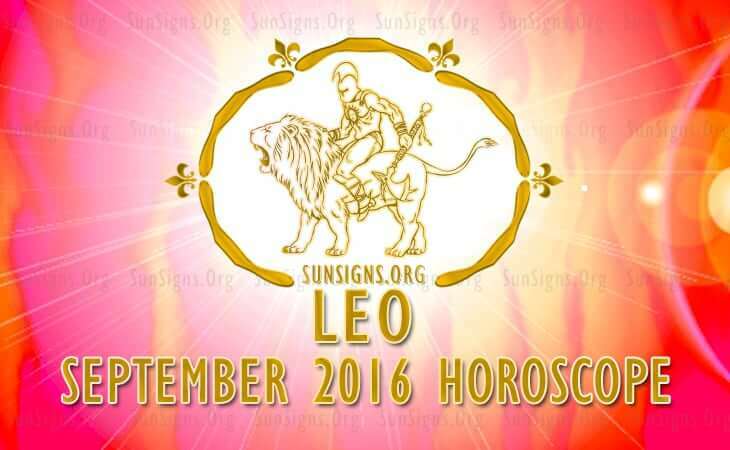 September 2016 Horoscope for the Leo zodiac sign predicts that you should divert your attention to issues of family and mental stability. Your professional dreams should be based on emotional strength. You can plan your strategies to make your dreams come true in the future. In September 2016, personal enterprise and hard work will be necessary for the Lions to accomplish their objectives. You can decide on your path to success without depending on others. All business projects which were in limbo will come alive and progress. The Leo astrology predictions for September 2016 forecasts that you will have many chances to change your career this month and you will be quite selective about the jobs you like. You will be interested in media, sales promotion and marketing areas. Travel within the country to promote your business is indicated. You will have many opportunities to improve your professional skills through advanced study and training. The earnings of Leo born people will be superb in September 2016. You will be compelled to change your financial planning and go in for reorganization of your investments. You will be paying more attention to your finances and all the projects which were held up will make progress due to good planetary aspects. Risky investments will be profitable in September 2016 for the Leos. You can expect money from unknown sources. The Leo monthly forecasts for September 2016 show that your relationship with your family members and neighbors will be affected. Money will play an important role in husband wife relationships. The eclipse will impact your marriage or existing partnerships. Strong Leo relationships will continue while weaker ones will fail. Single Leos will have many enjoyable relationships, but will not be serious. Pregnancy health related issues will be on your mind this month. The Leo health will be without any serious hiccups in September 2016. You have to rest sufficiently during the periods of the eclipses. You will make special efforts to take care of your skin and personal beauty this month. To conclude, the Leo horoscope for September 2016 shows that your family will need your attention more than ever this month.